Truly, necessity is the mother of invention. Imagine you’re an undertaker working in Kansas City in the late 19th century. You’re one of just two undertakers serving a city of more than 50,000 people, so business must be booming, right? Not if your competitor is stealing all of your clients. Legend has it that Almon Brown Strowger found himself in this exact position in the 1870s and 1880s. The wife of the other undertaker in town worked at the local telephone exchange, and whenever a caller would ask for Strowger’s services, she’d put the call through to her husband, instead. This left Strowger’s business in grave straits. His complaints to the telephone company proved unfruitful, so Strowger took matters into his own hands — by cobbling together hat pins and electromagnets into the first automated telephone exchange. Strowger patented his stepping exchange system in 1891 and installed it in La Porte, Indiana, in 1892. The basic design of the system — 10 rows each containing 10 different contacts — meant that it could serve up to 99 customers automatically. Essentially, the mechanism of the exchange would move based on pulses from two-part phone signals. Pulses from the first number would move the mechanism to a certain row, and the second pulse would swing a dial along that row to the proper column. Contact was made at that point, and the connection could be completed. For example, phone number 36 would drop the mechanism to row three, and then the contact arm would swing to column six. 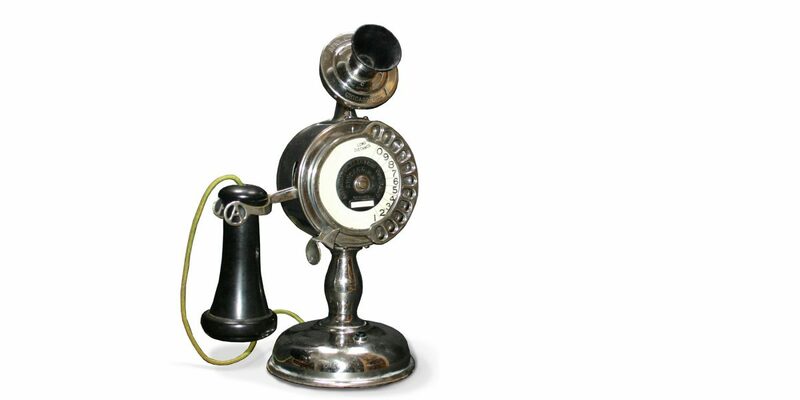 To facilitate this process, Strowger also invented the rotary dial, allowing customers to easily select a phone number by spinning the dial a certain distance. Each number pulsed a certain number of times, instructing the stepping exchange mechanism to walk over to the right contact. Bingo: no more cheating from the competition. You can find one of Strowger’s early 11-digit dial phones, a potbelly candlestick model from circa 1905, in the SPARK Museum of Electrical Invention in Bellingham. And if you want to learn more about this phone, check out John Jenkins’ book “Where Discovery Sparks Imagination.” You can find it on SPARK’s website or in the gift shop near the main lobby of the Museum. Strowger’s brilliant rotary telephone is just one of hundreds of intriguing inventions you’ll find on display at SPARK Museum of Electrical Invention in Bellingham. Swing on by!